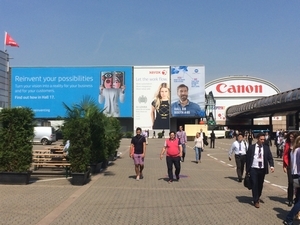 260,000 visitors from 188 countries (23 000 visitors per day on average) and 1837 exhibitors from 54 countries, all gathered in 19 huge halls: Drupa 2016 has once again been a great success. Held every four years in Düsseldorf, Germany, Drupa is the largest event for the professional printin world. DataMaster was present at this key event. This is the first of a series of articles on our team's feedback. Hall 5, Stand C20: two new series of MFPs and two new duplicators were on display at Riso Kagaku Corporation. The Japanese manufacturer used the event to showcase these products based on their inkjet technology. The ComColor GD9630, probably the fastest MFP jet ink in the world (160ppm), and was on preview. This motor is also equipped with the new FS2000C EFI Fiery controller. The 120ppm FW5230 MFP, part of the FW ComColor series, was also on show. In parallel, the SF9350 (monochrome) and ME9350E (color) duplicators were also on the stand. Finally, the presentation of the T1 (continuous-feed inkjet press) and T2 (inkjet digital printing press) concept was the icing on the cake. The Xerox stand put on a good show. With a DJ and loud music the intent was a nightclub feel, a huge dais at the entrance booth served as a platform and led to the dance floor. The focus was really on the presentation of new Brenva HD. Later we will dedicate a special article on printing large sheet format. IGen digital presses, and the Versant 2100 and 80 were also present. The star attraction of the Konica Minolta area was the AccurioJet KM-1, now availble for sale, and it was the first time to see the AccurioJet KM-C (C stands for carton or corrugated, and this will print onto 1.2 mm stock). We will be commenting on these machines in detail soon. On the digital press side, visitors had access to the latest machinery output on the market: bizhub Press 1250e, bizhub Press 1250eP, bizhub Pro 1100 and the bizhub 758 and bizhub 958 Pro. Lastly for now, Ricoh made a huge splash with a lightshow onto the continuous-feed VC60000 press (see next article). In parallel, the latest digital presses from the manufacturer were accessible to visitors: Pro C9100 Series, Pro C7100 Series, Pro 8100 Serieso or the Pro 5100 series. Watch this space for More From Drupa 2016!